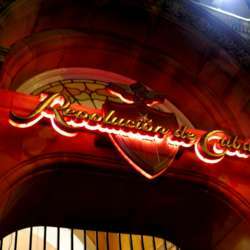 Our next fun, friendly and exciting evening will be at Revolución de Cuba. We will be in the DOWNSTAIRS bar, near the BACK of the venue, in the private roped off area - if you don't spot us, just ask a member of staff for the "InterNations Party". Right in the centre of Nottingham is a flavour of Havana and the home of Cuban-style celebracións. With a choice of classic Cuban cocktails and selection of the finest rums in the world. Come and join us for a cocktail (or few) and food also, if you're feeling peckish! Rich, aromatic Cuban coffee, full-on Latin-inspired feasts & choice of fresh tapas. DATE: Thursday, 28 March from 19:30. Come along and have a good time, make new friends and mingle with like-minded internationals. Plenty of drinks offers on the night as well. 'Revolución de Cuba' is on Market Street and just a short walk from the Old Market Square in Nottingham & the Theatre Royal Concert Hall Tram stops.